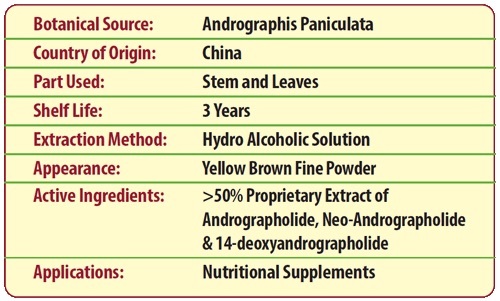 Andrographis Paniculata is an annual herbaceous plant in the family Acanthaceae, and is one of the most commonly used medicinal plants in the traditional systems of Traditional Chinese and Ayurvedic medicines. It is widely cultivated in India, China, and Southeastern Asia. A. paniculata have shown a broad range of pharmacological effects such as anti-viral, antibacterial, prevention of common cold, anti-diarrheal, support healthy blood glucose, and support healthy inflammatory response. It is know as the “king of bitters” due to its bitter flavor profile. Andrographolide, an active ingredient in Andrographis, has been shown to be responsible for the herb’s inflammatory modulating actions. ParActin® is a patented extract of Andrographis Paniculata, standardized to Andrographolide, 14-deoxyandrographolide, and Neoandrographolide. (US Patent No: 8,084,495 B2) Preliminary research has shown ParActin® to promote healthy inflammatory response by naturally invigorating the PPAR gamma response, inhibiting NF-kappaB, the key regulator of our inflammatory response system, thereby naturally reducing pro-inflammatory cytokines and proteins associated with pain and redness from everyday activities. NF-kB and NFAT are key regulator of our immune and inflammatory response system. 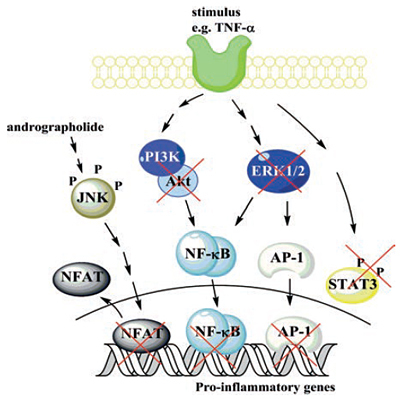 Research has shown NF-kB to be activated in rheumatoid synovium cells. Both in vitro and in vivo research showed ParActin® to inhibit NF-kB activity and reduced the DNA binding of NF-kB, thereby reducing IL-2, COX-2, and PGE2. In vitro study also showed ParActin® to inhibit NFAT activity, a transcription factor linked with bone erosion. ParActin® also induces osteoblast mineralization on the bones via COX-2 expression, which could be of useful in preventing osteoporosis. In a randomized, double blind, and placebo-controlled study published on Clinical Rheumatology 2009, 60 patients with rheumatoid arthritis were given 100mg of ParActin® or placebo three times a day for 14 weeks in conjunction with MTX. ParActin® was effective in reducing number of swollen joints, total grade of swollen joint and tender joints. ParActin® help normalize Rheumatoid Factor, creatinkinase, hemoglobin, immunoglobin IgA and IgM. The reduction in IgA and IgM is beneficial as there is positive correlation between the grade of cartilage damage. In another clinical published on Innovative Rheumatology Jan 2013, 8 patients with various rheumatoid conditions were given 300mg of ParActin® daily for 3 ½ years. Treatment with ParActin® showed significant improvement in number of swollen joints, total grade of swollen joint, total grade of tender joints, and improvement in Quality of Life. In addition, we are seeing significant reduction in Rheumatoid Factor, Eryhrocytes Sedimentation Rate, Pain, and C-Reactive Protein. 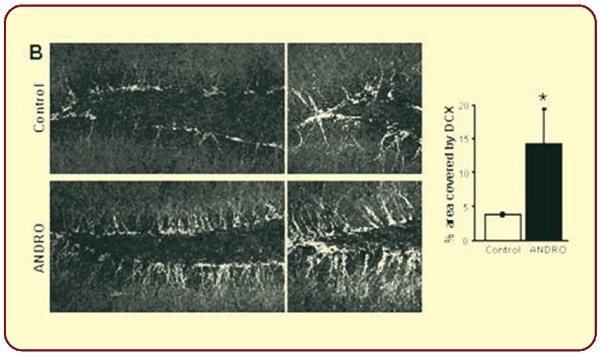 ParActin® significantly reduced the RF value from 110 to 70 mg/dl. The placebo group, did not experience any significant change in RF value. In another clinical published on Innovative Rheumatology Jan 2013, 8 patients with various rheumatoid conditions were given 300mg of ParActin® daily for 4 years. Treatment with ParActin® showed significant improvement in number of swollen joints, total grade of swollen joint, total grade of tender joints, and improvement in Quality of Life. In addition, we are seeing significant reduction in Rheumatoid Factor, Erythrocytes Sedimentation Rate, and C-Reactive Protein. Serum immunological parameters of inflammation were reduced progressively during 48 month of ParActin® treatment. After 24 months the treatment with Paractin®, 6 patients were administered only with ParActin® as monotherapy. All patients are showing full tolerability, no remission of clinical and serological inflammatory parameters. In the process of bone formation, osteoblasts produce a calcium and phosphate-based mineral that is deposited. Almost the entire bone matrix is mineralized by the osteoblasts. An osteoclast is a type of bone cell that resorbs and break down bone tissue. Balance of bone formation and bone resorption tends to be negative with age, particularly in post-menopausal women, often leading to a loss of bone serious enough to cause fractures, which is called osteoporosis. ParActin® increase osteoblast and has a mineralizing effect on the bones with the increase of calcium ddeposits. Therefore, it could be beneficial in osteoporosis. In a research published on Skeletal Muscle 2014, we investigated the effects of ParActin® on the onset of dystrophy in mdx mice, an animal model used to study MD. 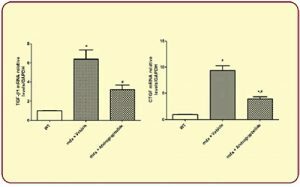 Administration of ParActin® reduced necrosis, and cumulative muscle damage compared with vehicle-treated mdx mice. 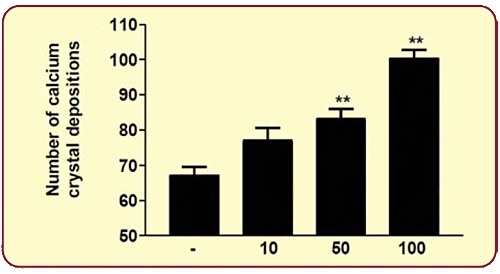 Concordantly, serum CK levels were decreased in ParActin® treated mdx mice compared with control mdx mice, with an approximately 50% recovery score. Development of fibrosis in is characterized by an increase in extracellular matrix compounds such as fibronectin and several types of collagen. ParActin® treatment decreased fibronectin and collagen III protein levels. 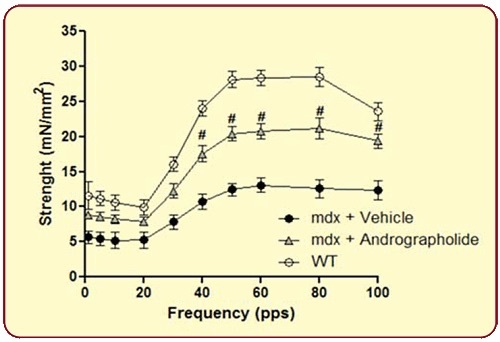 ParActin® treated mice exhibited less severe muscular dystrophy, performed better in an exercise endurance test, and had improved muscle strength compared to untreated mdx mice. ParActin® treatment reduced TGF-β, an important pro-fibrotic factor in mdx skeletal muscle. 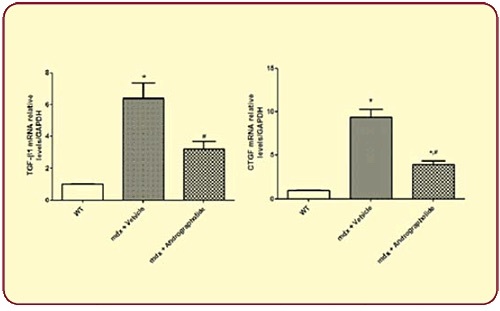 In addition, Connective tissue growth factor (CTGF) and collagen type I, two downstream pro-fibrotic factors in dystrophic skeletal muscle were also reduced by ParActin® treatment. ParActin®-treated mdx mice showed an enhanced exercise performance, significant increase in the generation of isometric force, and higher strength in the TA muscle. This is evidenced by a significant decrease in the number of detentions in the treadmill running protocol, with recovery score of 45.5%. In the Morris Mice Water Maze Experiment, the mice were trained in a circular pool to locate the escape platform. 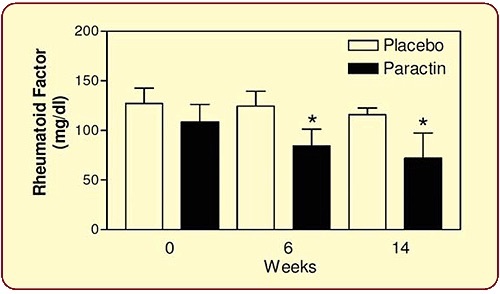 Transgenic mice treated with ParActin® showed improve learning and memory. The lower escape latency values indicate that ParActin® was able to reduce the cognitive impairment in the spatial memory performance. ParActin® alleviates memory decline by inducing postsynaptic proteins and synaptic function in the transgenic mice. In addition, ParActin® prevents the inflammatory oxidative stress and tau phosphorylation in the hipocamppus. Tau protein stabilizes microtubules and is abundantly present in brain. 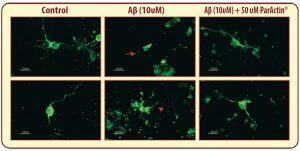 Beta amyloid induces the occurrence of phospho-epitopes in tau protein associated with neuronal damage. When Tau protein is defective, they no longer stabilizes microtubules properly and can result in dementia such as Alzheimer. ParActin® prevents tau hyperphosphorylation, increases field excitatory postsynaptic potentials, and inhibits long-term depression (LTD) via the inhibition of the glycogen synthase kinase-3β. Glycogen synthase kinase-3β is an enzyme that regulates Wnt signaling pathway, gene transcription, and neuronal cell function. The Wnt/β-catenin signaling pathway is essential in the nervous system and participates in the neural tube formation and midbrain development. Blocked Wnt pathway caused reduced neurogenesis and impaired learning and memory function. ParActin® activates Wnt signaling pathway by a mechanism that bypasses the Wnt receptor and involves inhibition of GSK-3β. In silico analyses ParActin® directly inhibits GSK-3β by competing at the substrate binding site. In vivo research showed that treatment of 2 month-old wild-type mice treated with ParActin® for 4 weeks strongly induces cell proliferation and the generation of newborn neurons in the dentate gyrus, increases density of immature neurons, increases percentage of the granular cell layer, more complex morphology, and induces development of newborn neurons. Burgos, R. A, Hancke, J. L, Bertoglio, J. C, Aguirre, V, Arriagada, S, Calvo, M, et al. 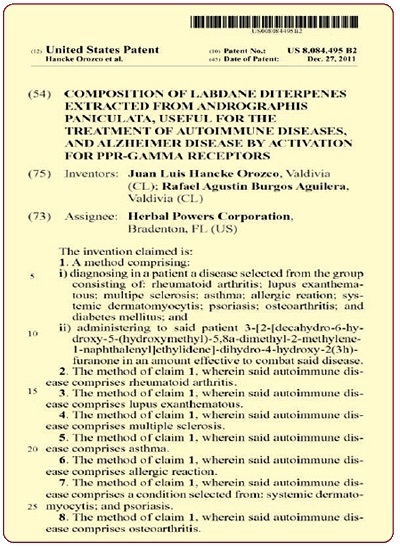 Efficacy of an Andrographis paniculata composition for the relief of rheumatoid arthritis symptoms: a prospective randomized placebo-controlled trial. Clin Rheumatol. (2009), 28(8), 931-46. Burgos, R. A, Hidalgo, M. A, Carretta, M. D, Bertoglio, J. C, Folch, H, & Hancke, J. L. Immunomodulatory activities induced by Andrographis paniculata. Studium Press LLC; (2009). Mirentxu I. Iruretagoyena, Claudio A. Figueroa, Rafael A. Burgos, Juan L. Hancke. 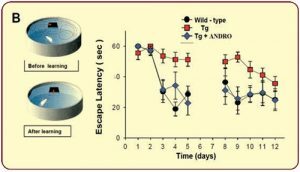 Andrographolide interferes with T cell activation and reduces experimental autoimmune encephalomyelitis in the mouse. J Pharmacol Exp Ther. (2005). , 312(1), 366-72. Burgos, R. A, Seguel, K, Perez, M, Meneses, A, Ortega, M, Guarda, M. I, et al. Andrographolide inhibits IFN-gamma and IL-2 cytokine production and protects against cell apoptosis. Planta Med. (2005). , 71(5), 429-34. Hidalgo, M. A, Romero, A, Figueroa, J, Cortes, P, Concha, I. I, Hancke, J. L, et al. 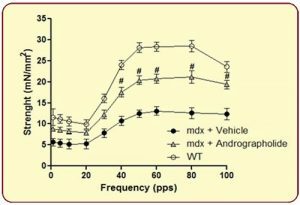 Andrographolide interferes with binding of nuclear factor-kappaB to DNA in HL-60-derived neutrophilic cells. Br J Pharmacol. (2005). , 144(5), 680-6.